The Selangor Development Corp (PKNS) will launch new housing and commercial projects worth RM300 million collectively in Shah Alam, Kota Puteri, Kota Damansara and Selayang in May. At the same time, it will relaunch existing stocks valued in total at RM180 million in Bangi, Shah Alam, Kota Damansara, Bandar Sultan Sulaiman, Kota Puteri, Antara Gapi and Bernam Jaya. Overall, it will launch 3,525 units of medium- to high-end houses, shop offices and factories, said PKNS general manager Othman Omar. Half of them will be built by June. The rest will be built by early next year. "We are confident to sell. Our pricing is affordable and not as expensive as private developers. 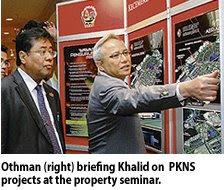 And the impor-tant thing is, we will deliver,"Othman said at a property seminar in Kuala Lumpur yesterday. PKNS will launch a month-long housing campaign starting May 8 to promote the properties. Last week, it sold 20 units of semi-detached houses worth RM18.7 million in Bandar Baru Bangi. Othman said PKNS will continue to launch affordable homes despite the economic slowdown but will focus on developed areas in the Klang Valley. "We are profit-driven, hence, will focus on locations where there is demand, and the areas are developed. We will fine-tune the progress so there is no oversupply. We plan to maintain the rate of construction," he added. PKNS will also develop projects jointly with private developers and will award contracts based on open tenders, Othman said. Magna Prima Bhd may build luxury residences or office towers, or both, on the 1.05ha prime site in Jalan Ampang, Kuala Lumpur, which it is buying from a school association. It is learned that Magna is finalising the development features, which will be market-driven. "We are doing a study to decide on the best components. It may be office towers, or commercial and residential mix," an official said on condition of anonymity. The project, worth more than RM1.3 billion, will begin in 2012 and be completed in four years. It will be Magna's single largest development to date and its second project in the Kuala Lumpur City Centre area. The first was the RM300 million Avare condominium, neighbouring the Petronas Twin Towers near Jalan Stonor, launched in 2005. "Magna aims to start the project in 2012 as it believes the economic situation will improve by then, thanks to the two stimulus packages launched by the government," the official added. The official said it may construct the buildings on its own, or in a venture with a reputable firm to be identified later. Magna is buying the land on which the 44-year-old Lai Meng Primary School and Kindergarten sits from the Lai Meng Girls School Association for RM148 million. It may use its own funds as well as borrow to pay for the land, the official said. Under the agreement, Magna is to rebuild the school and kindergarten on land it owns. It is unclear where Magna will rebuild the school. The company has pockets of land in Bukit Jalil and Jalan Kuching, Kuala Lumpur. "We have not decided on the location. We will call for open tender to build the school, which will be at a choice location," the official said. Analysts, who declined to be named, said that Magna is acquiring the land at a fair price and may sell the properties for between RM950 and RM1,000 per sq ft.
"Assuming 10 times plot ratio, construction cost of RM400 per sq ft and 80 per cent efficiency ratio, it would potentially translate into a total redevelopment cost of RM660 per sq ft, with average selling price of RM950 per sq ft, at 30 per cent margin," said an analyst. SELANGOR aims to revive a third of 147 abandoned housing projects in the state over the next one year. The projects cover more than 50,000 houses, worth some RM5 billion in total, and they have been sitting idle since 1997. "It will be good for developers to revive these projects, instead of launching new ones. Incentives will be given to those who come forward," said Iskandar Abdul Samad, the state executive councilor in charge of housing, building management and squatters. These includes fast-track approvals and the rescheduling of up to RM1 million in quit rent payment owed by previous developers on a single project. Iskandar said developers will also make money faster as the projects have units that have been sold. He was speaking to Business Times on the sidelines of a real estate convention organised by the Selangor Development Corp (PKNS) in Kuala Lumpur yesterday. The projects were abandoned by some 80 developers that had faced cash flow problems, causing hardship to buyers. "We have formed three groups to match the developers of the abandoned projects to those who are willing to take over. So far, 13 projects have been revived," Iskandar said. The state will also seek help from the Real Estate and Housing Developers Association and the Malaysian chapter of the International Real Estate Federation on the matter. BOUSTEAD Holdings Bhd's (BHB) unit, Boustead Building Materials Sdn Bhd, has been awarded a RM18.9 million deal from from Boustead Hotels and Resorts Sdn Bhd, also a subsidiary. In a filing to Bursa Malaysia, BHB said the contract involved the construction and completion of earthworks, piling and sub-structure works in relation to the proposed construction of a 12-storey, four-star, 301-room hotel and two levels of basement of car parking in Mutiara Damansara, Selangor. It said the contract would be funded through bank borrowings and/or internally-generated funds. KUALA LUMPUR: The assets under management by Am ARA REIT Managers Sdn Bhd, the manager of AmFIRST Real Estate Investment Trust (AmFIRST), have increased by 17% to RM980mil from RM837mil. In a statement yesterday, AmInvestment Bank Group said the increase followed the recent revaluation exercise undertaken on all of its investment properties. “Subsequently, AmFIRST’s net asset value per unit has also increased to RM1.32 per unit from 99 sen (as at January 2), upon incorporation of the revaluation surplus,” it said. Am ARA chief executive officer Lim Yoon Peng said the company had the advantage in terms of locations and would fully utilise them to further strengthen the occupancy rate and thus improving its earnings. AmFIRST currently has six properties. - Bangunan AmBank Group, Menara AmBank Group, AmBank Group Leadership Centre, Menara Merais, Kelana Brem Tower and the Summit Subang USJ.